THE PLIGHT of Ron Davies, once considered to be one of the best centre forwards in Britain, sums up the difference between football in the 1970s and the current bloated state of the game. Davies, who died last week, aged 70, ended his life living in a mobile home in the US and struggled to raise the money necessary for the operations he needed to make his old age more comfortable. There were no millions for the Welsh international from Holywell in Flintshire. Davies never played for a fashionable club in his peak years. Today, a player of his calibre wouldn’t hang around clubs like Norwich, Southampton, Chester and Luton. They would be snapped up by the big-guns, and although he had a brief spell with a low-ebbed Manchester United in 1974, he spent most of his time with also-rans. Ron Davies’ speciality was heading the ball, a trademark that in the late 1960s and early 1970s, still had considerable currency. His ability to take-off and meet a teasing cross was a match-winning art and he scored many of his goals thumping the ball home with his head. 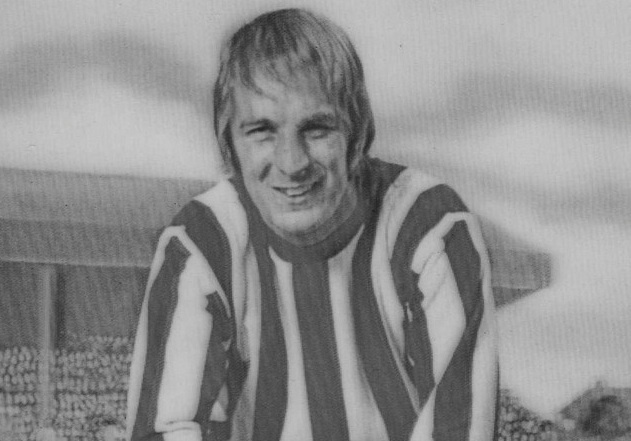 In 1966-67, for example, he netted 37 in 41 league appearances for the Saints. For Wales, he was just as effective, although his country was just as also-ran as the clubs he played for, although his nine goals in 29 appearances for the national side was a respectable return. I recall a game with Scotland at the end of the 1968-69 season where he scored twice in a 3-5 defeat in Cardiff – Davies, almost on his own, taking on the Scots. The following season, Davies was hailed the best centre forward of his kind by Manchester United’s Sir Matt Busby as the Saints won 4-1 at Old Trafford. Davies scored all four, three with his head, each time jumping at the far post, leaving the United defence floundering. Such was Davies’ burgeoning reputation that in a best-selling boys’ comic, I think perhaps Beezer or Topper, he was named in a Great Britain XI alongside players like George Best, Bobby Charlton and Bobby Moore. In some ways, he was to Wales and Southampton what Geoff Hurst was for England and West Ham. To many critics, he was a better player than Hurst, although history will remember Hurst for obvious reasons. Davies also helped to make the careers of others. Mick Channon and Martin Chivers, the latter sold to Tottenham in 1968, probably owed part of their early development to him. Davies belonged to an era when outstanding players were more evenly distributed around the Football League. In the 21st century, his kind would, predictably, be playing for Manchester United, Chelsea or Arsenal. It was worth watching Southampton in the late 1960s just to see him in action. How often can you say that today?